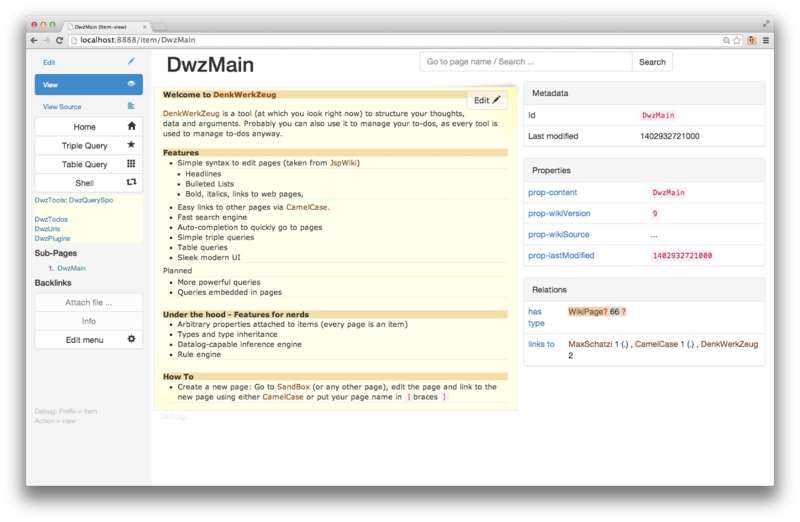 DenkWerkZeug is a personal, single-user desktop software tool. It let's you enter facts and connected items. Then you can view an automatically generated graph, navigate around and do queries. The current iteration of DenkWerkZeug is a personal semantic wiki, to be used on a desktop-grade computer, e.g. a laptop. DenkWerkZeug is not social, not built for sharing. DenkWerkZeug is a tool (at which you look right now) to structure your thoughts, data and arguments. Probably you can also use it to manage your to-dos, as every tool is used to manage to-dos anyway. Easy links to other pages via CamelCase. The "pink card design" from previous posts might be used to render the right side in the future. The next steps are a solid knowledge model API which will then be thoroughly tested. 30 German software tools for "Wissensmanagement"